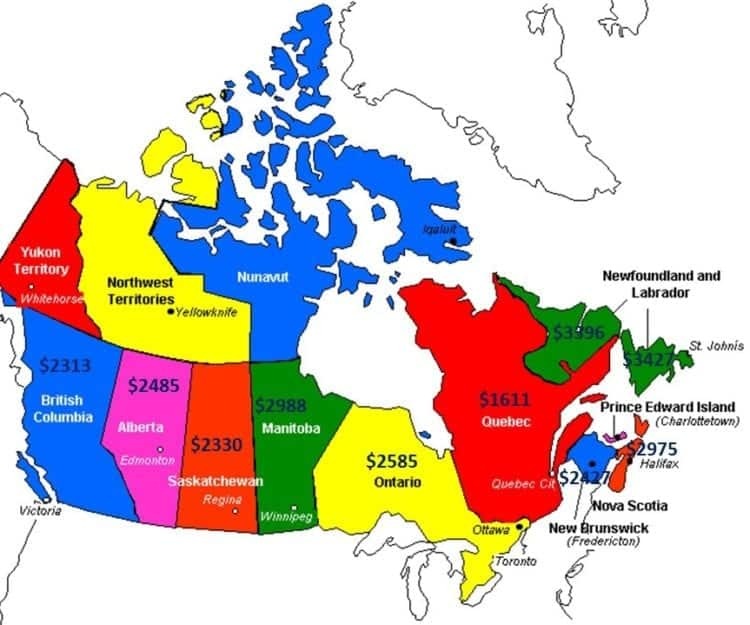 The most recent data available from 2011 indicates that the cost per person per year of having Type 2 Diabetes in Canada ranges from $1611 (Quebec) to $3427 (New Brunswick) based on an average income of $43,000 per year. Necessary medications, devices and supplies are expensive – costing more than 3% of income. While those with extended health benefits now may not consider this cost now, a change in employment circumstances can affect this overnight. As Type 2 Diabetes progresses, more medications are often added and the number of times blood sugar needs to be taken each day often increases, as well. Job loss or retirement suddenly results in Canadians being faced with bearing the burden of their disease, along with the chronic, progressive nature of poorly managed blood sugars. Long term studies that have been published in the last couple of years (reviewed in previous articles on this site) which demonstrate that a well-designed low carbohydrate or ketogenic diet can and does enable a significant improvement in Type 2 Diabetes symptoms. After as little as 10 weeks, glycosylated Hemoglobin (HbA1C) has been reported to drop a full percentage point; from 7.6% to 6.6%. After a year, the average HbA1C was 6.3%, which is below the diagnostic criteria for Type 2 Diabetes. That is, in just a year of following a well-designed low carbohydrate diet, it has been demonstrated that people can get their average blood glucose in the non-Diabetic range. Medication use drops substantially when people are able to control their blood sugar by limiting the amount and types of carbohydrates they eat. At the start of the study mentioned above published in Feb of 2018, 87% of people were taking at least one medication for Diabetes and at just 10 weeks, almost 57% had one or more Diabetes medications reduced or eliminated. After one year, Type 2 Diabetes medication prescriptions other than Metformin declined from 57% to below 30%. Insulin injections were reduced or eliminated in 94% of users and sulfonylurea medication was entirely eliminated. For each one of these individuals, a simple change to a low carbohydrate diet resulted not only in significantly improved health and a reduction in Diabetes symptoms, but in significantly reduced cost, as well. According to Virta Health who conducted the study referred to above, cost savings are as indicated in this diagram below. 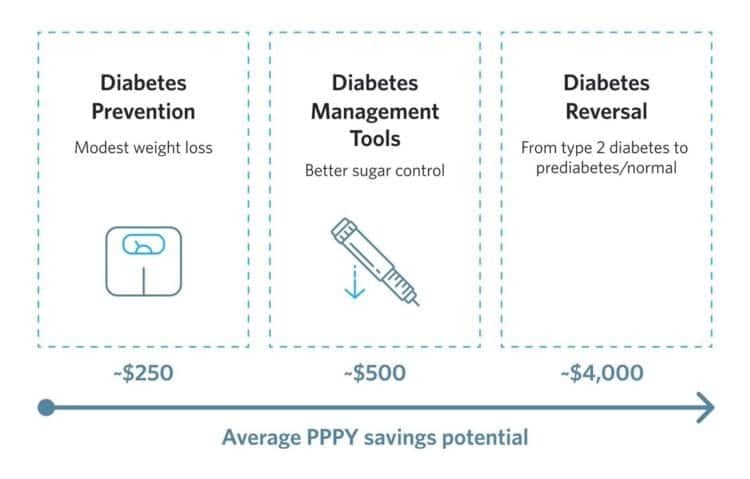 The cost of "Diabetes Reversal" below reflects the estimated cost of an individual being cared for by the Virta Health multi-disciplinary team program, which appears to be an excellent program given the methods used in the studies they have published. It should be noted that the cost of working one-on-one with me over the course of a year (and as overseen by your GP) is substantially less. In fact, getting started by being assessed and having me design an individual Meal Plan just for you is significantly less than the yearly cost of achieving better blood sugar control in the graphic below. Sometimes people are hesitant to invest in the cost of seeing a Registered Dietitian who can help them adopt a low carbohydrate lifestyle that can enable them to achieve significantly improved blood sugar control – even though the yearly costs of Diabetes supplies is far greater than the cost of being assessed and getting a Individualized Meal Plan. 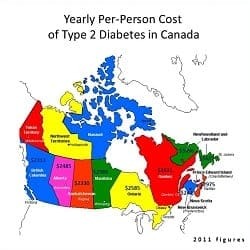 Such an estimate is at the level of health they are today, but waiting a few years, with longer Type 2 Diabetes, more medications, possibly including insulin injections, and the cost is closer to $3500 in 2011 Canadian dollars / $4000 in 2018 (US) dollars. The sooner someone changes their diet and lifestyle upon being diagnosed with Type 2 Diabetes, the more likely it seems they may be able to achieve full remission of symptoms. If you’ve followed my own story on “A Dietitian’s Journey” then you know how much harder it is for me, after being diagnosed 10 years ago. If you have extended benefit coverage, then now is the time to invest some time in learning how to make lifestyle changes that will benefit your health and your finances for the years to come. Even for those without such coverage, the cost of an assessment package which will provide you with a Meal Plan designed specifically for you is substantially less than you are already paying for your medications, devices and supplies. I provide both in-person services in my Coquitlam, British Columbia office and via Skype Distance Consultations. If you have questions about this package entails or about the flexible payment options that are available, why not send me a note using the “Contact Me” form located above? I’ll be happy to reply.